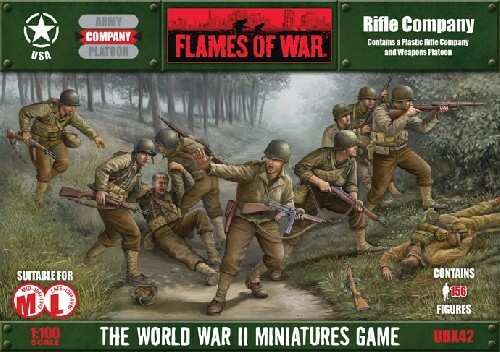 includes two plastic Command sprues, six plastic Infantry sprues, five Small three-hole bases, two Small two-hole bases, twenty five Medium four-hole bases, & two plastic hole plug sprues. The American war effort is carred on the back of its GIs. Equipped with the latest technology and backed by the industrial might of America, the GI presses forward to victory. When the situation becomes tricky, they will quickly overcome obstacles to win the field of combat securing freedom every step they take!